The R-PLEX Human CD31 Antibody Set includes a matched capture and detection antibody pair and calibrator for the quick and easy measurement of PECAM-1/CD31 in biological samples. R-PLEX products leverage MSD’s electrochemiluminescence technology for better sensitivity and a larger dynamic range than traditional ELISAs. R-PLEX matched antibody sets enable the development of singleplex and multiplex immunoassays. Individual assays may be developed using MSD avidin- or streptavidin-coated plates. Custom multiplex assays with any combination of R-PLEX analytes, as well as R-PLEX plus U-PLEX analytes can be developed on U-PLEX MULTI-SPOT plates. To learn more about the advantages of R-PLEX products click here. 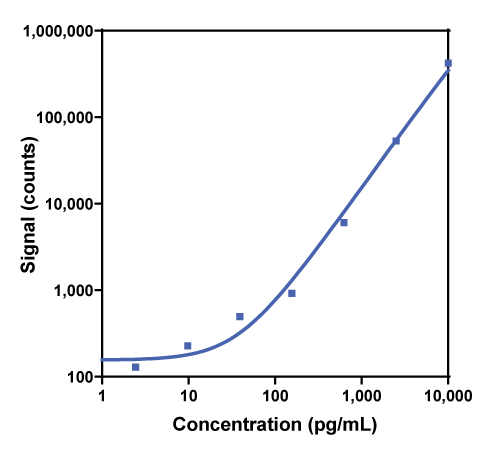 Calibration curve for the R-PLEX Human CD31 Antibody Set was assessed and representative data is presented below. Description - Platelet endothelial cell adhesion molecule / Cluster of differentiation 31 (CD31, PECAM-1, PECA1, GPIIA', PECAM-1, endoCAM, CD31/EndoCAM) is a 130 kDa transmembrane protein (type I) found on the surface of endothelial cell as well as several types of blood cells including monocytes, neutrophils, platelets, and certain T-cells. PECAM-1 belongs to the Cell Adhesion Molecule (CAM) immunoglobulin superfamily and is believed to be involved in leucocyte migration through intercellular junctions. Like many of the proteins in this family, PECAM-1 may also be involved in angiogenesis and activation of the integrin pathway.